As you may have heard (!) I survived a serious accident in January of this year. I actually considered jacking it all in at first… but my passion for movement proved stronger. I put in the work, determined to come back a better mover and overcoming my injuries has been my greatest learning experience yet. My mission is to create and share specialised workshops with focus on the joy and empowerment of movement through dance and fitness methodologies. I am focused on building a strong inclusive movement community through accessible training, building resiliency and capacity, while creating beauty in any domain. 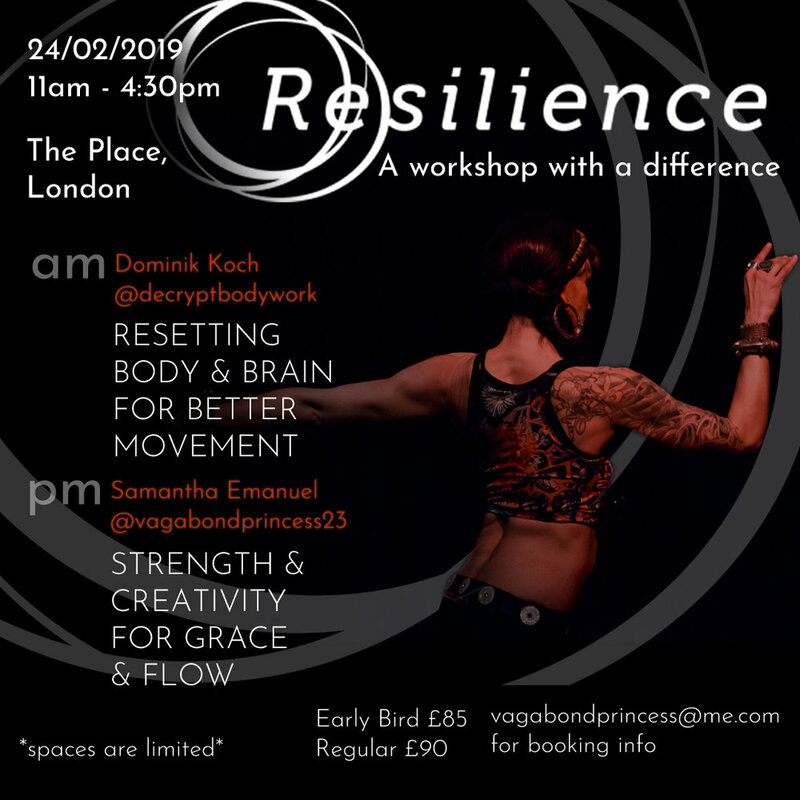 In line with this mission I have invited Dominik of Decrypt Bodywork to share his knowledge with us as part of the Resilience London workshop! I believe his work compliments my mission perfectly and I cant wait to explore these new avenues with YOU. Dominik will kick off the day with a session of self-discovery to help restore balance from head to toe. He will guide us on a journey to re-educate the nervous system about the body’s position in space and its available movement. A fusion of somatics, biomechanics and brain science will create conscious awareness of the body’s interconnectedness, extending the range of subconscious movement options that are available when performing. After a short break, Samantha will guide an exploration of movement possibility using Functional Range Conditioning® techniques for mobility, breath work, Pilates exercises, strength building, movement drills, dance flows and creative work inspired by games and task based training. 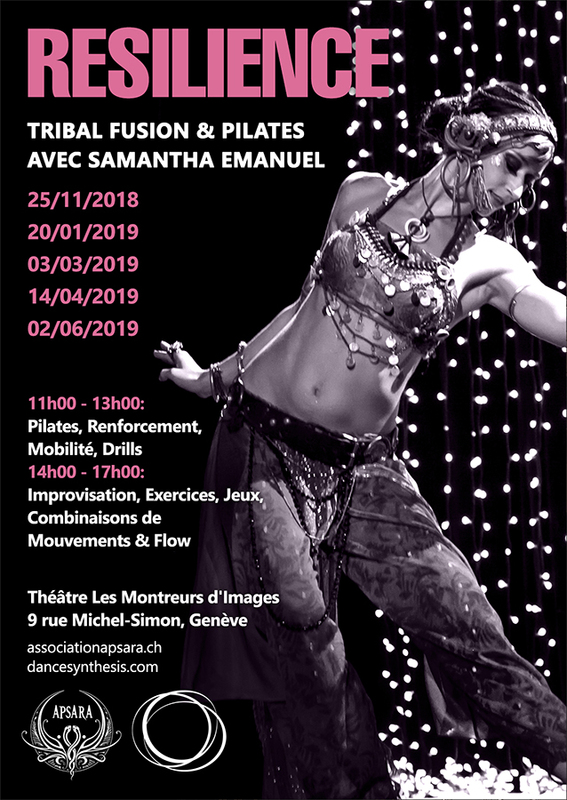 While Samatha’s dance is rooted in Tribal Fusion Belly Dance, this workshop is OPEN TO ALL MOVERS who are interested in finding centre, increasing efficiency and maximising potential. Dominik Koch is a movement specialist who founded Decrypt Bodywork to help people solve seemingly unsolvable pain and to unlock hidden potential in performance. Making the unreadable readable forms the core of his work, allowing his clients to discover and respond to restrictions by giving the body what it wants. His journey into the world of questioning the body began when he was unable to find help with chronic neck pain and a long list of recurring shoulder injuries. Along the way to restoring his own health and of those around him, he learned that where we feel and where we have to resolve a problem are rarely in the same spot. In his approach to freeing up movement, and ultimately restoring balance, he takes a step back from the area of complaint and shines a light on the rest of the system, always asking WHY the body may want to put the brakes on. He involves body and brain to the same extent, as he believes that the two are inseparable if we want lasting change. His exploratory way of moving the body is educational, simple and effective and you’re sure to leave having discovered something new about yourself and the body that you live and perform in. Samantha discovered movement in her early 20's, through Kung Fu and Belly Dance. She quickly discovered Tribal fusion thanks to Rachel Brice and fell for the style. She had found her passion, her niche and has been studying, teaching and performing internationally since 2006. She toured with Miles Copeland's The Bellydance Superstars, collaborating with dancers at the top of the genre. She has performed and taught workshops in over 42 countries. Her dedication to movement and its power to connect people from all continents keep me on the move. In 2018 a serious accident left her immobilised. She worked through ten months of rehabilitation. Living through the experience has given her better understanding for those with injuries, at the physical and psychological level. It taught her the absolute value of movement for ALL. She is driven to learn and to share the limitless benefits of movement through varied disciplines. Please arrive on time as we start promptly at 11AM and please bring a yoga/pilates mat! I have always believed in the benefits of cross training belly dancers for injury prevention, as you will know if you have taken workshops with me in the past! I believe belly dance movements alone do not create the strength necessary for long term resilience. I see dancers who have continued to perform into later years will usually have another movement modality (or multiple) to compliment their dance training. Be that yoga, Pilates, other styles of dance, some form of cross training. Meet Ryan Trificana. Owner/Operator at Genfit, Colorado USA. Like me, Ryan also rehabilitated himself from a major injury (he also survived depression and loss of motivation to move) and like me he also discovered GMB Fitness when he needed it most. We both used GMB to aid our recovery. I used the on line training and Ryan is now a certified GMB instructor. We learned patience and the importance of finding the "why" so that on the days that our training/rehab/life got tough, we had something concrete to return to. Our stories post injury both include a big shift in perspective, practice and teaching method. Through our commonalities and differences, we share an approach to exercise that is designed to yield strength and mobility gains that are accessible to all levels. Using our combined values on mindful, beautiful movement we can help you to mitigate and recover from injury more effectively, and make you a happier and better mover. Fitness, strength and conditioning. Bodyweight strength and skill training. Mindful movement. Certified Buti Yoga Instructor. Certified Pilates Instructor. Fusion Belly Dance. Improvisation. Flow. Theatrical performance skill training. Musicality. Watch this space for where we are taking our collaboration and how it could benefit your practice!